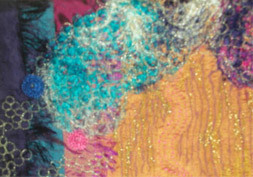 I create richly textured, vibrant wall hangings by combining hand and machine embroidery over a rich silk background. 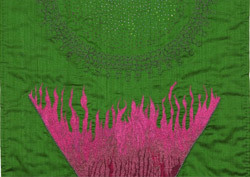 The work is mostly abstract, often inspired by spiritual or religious themes and nature. My home city of Varanasi, in northern India, is a famous place of pilgrimage for Hindus, but it is also known for its exquisite silk brocades. The beauty of this ancient place and its rich iconography still inform much of my work today. It is also a world full of colour and exuberance and these are qualities that I try to carry into my work. Varanasi’s wonderful textile silk tradition has also been a major influence and indeed a deciding factor in my choice of medium. 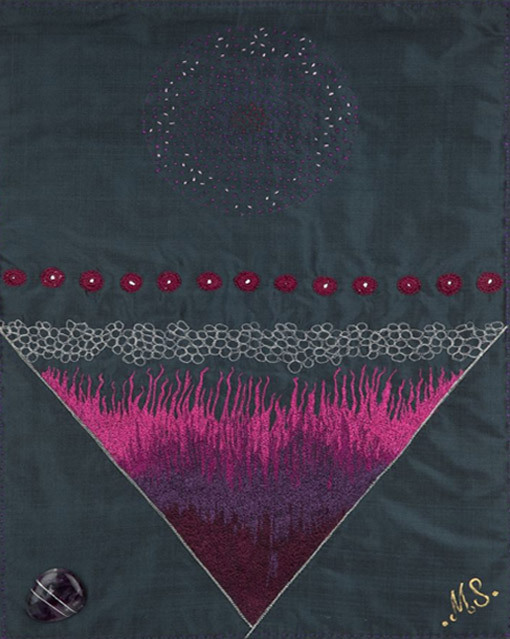 The magic of textiles has always been such a source of wonderment for me that it seemed a natural development to use needles and thread as my means of artistic expression, rather than brush and paint – a decision I have never regretted. The culture and the arts of northern India are a fusion of two great religious and artistic traditions: Hinduism and Islam. The latter gave me a fascination with geometric patterns. Many of my pieces reflect a search into the meditative and contemplative qualities of geometric shapes. On the other hand, the major landmark of the city of Varanasi, and a potent symbol of Hinduism, is the all-pervading presence of the river Ganges, gentle as the dawn, or raging in flood. The flow of the river, akin to the journey we all make through life, is another strong and recurring feature of my work. In recent years I have also produced more figurative work which expresses my love of the natural world. A whole series looked at the symbolism of certain trees and plants within the Hindu and Buddhist traditions. You will find several examples of these on the site. The retrospective featured in this website shows a good selection of works belonging to various periods and will give you an idea of the themes that move and motivate me. I hope you will share my feelings and interest. The gallery of new work is regularly updated and contains pieces which reflect my present thinking and motivation. The site will also keep you abreast of forthcoming exhibitions, publications and other activities. Do get in touch if you would like to discuss an aspect of the work or you are interested in a particular piece. My studio is also always open to visitors by appointment.